Sur la rive nord luxuriante de Kauai, aussi connu comme le Jardin Isle, se trouve un paradis tropical appelé Mauna Kai. Nous avons été bénis avec ce entièrement meublé trois chambres et deux salles de bains appartement, situé dans le quartier le plus prisé sur cette propriété. Le deuxième étage salon / cuisine donne sur certaines des plus majestueuses vues sur les montagnes et les cascades sur Kauai avec les montagnes sont le dos à la piscine. Amusements Beach Fun fournis tels que refroidisseur, planches de bodyboard, équipement de plongée et palmes, parasol, serviettes et chaises, beaucoup de jouets de château de sable enfants. Notre maison est située juste en face de la plus grande piscine de Princeville! Marsha’s home was a perfect place for my family to stay on Kauai. It is comfortable and spacious with everything we needed, including a well-stocked kitchen and snorkeling equipment and boogie boards for the kids. It’s a great location, walking distance to one beach and a short drive to several others. The pool was also really nice. Marsha was a perfect host who responded quickly to questions and provided all information we needed but otherwise left us alone to enjoy our vacation. We would happily stay there again. Much Mahalo’s Sophie for your kind words. It was a pleasure hosting your family. This was our first trip to Kauai...a family vacation to celebrate the wedding of our son and fiancé. It was an interesting week, since it seems we experienced the 'edge ' of a hurricane! This lasted for a few days. What impressed us was Marsha's constant checking in with caring and concern about our comfort. We kept busy and managed some great outings between rain drops! Poipu beach and Hanalei were our favourites. The condo was lovely and well outfitted with condiments, cooking utensils and any possible item one might need to make our stay well accommodated. There was lots of room for all 5 of us and so it was very homey and comfortable. It truly felt like home. Highly recommended! Thanks so much Marsha! Aloha Linda, thank you for your kind words. In the 40 years I’ve lived in the islands we have never experienced a “Nor’Easter” like we did during your stay! You and your family were real troopers! Thank you for being awesome guests; treating my home like yours! Beautiful and convenient location. Lots of amenities provided by the hosts! We had a very comfortable stay in Marsha and Todd's home for our family of 5 (2 adults, 3 kids aged 10, 8, and 5). This townhouse is well-cared for and loved by the owners. I felt like I was house sitting for friends! Marsha and Todd provided lots of bath towels, beach towels, and other beach accessories such as a cooler, sand castle toys, and beach chairs. The kitchen had everything we needed to cook most of our meals at home, saving us a lot of money during our vacation (3 boys eat a lot!). We were invited to help ourselves to any condiments in the fridge unlike some other properties we've stayed at where nothing is provided at all. 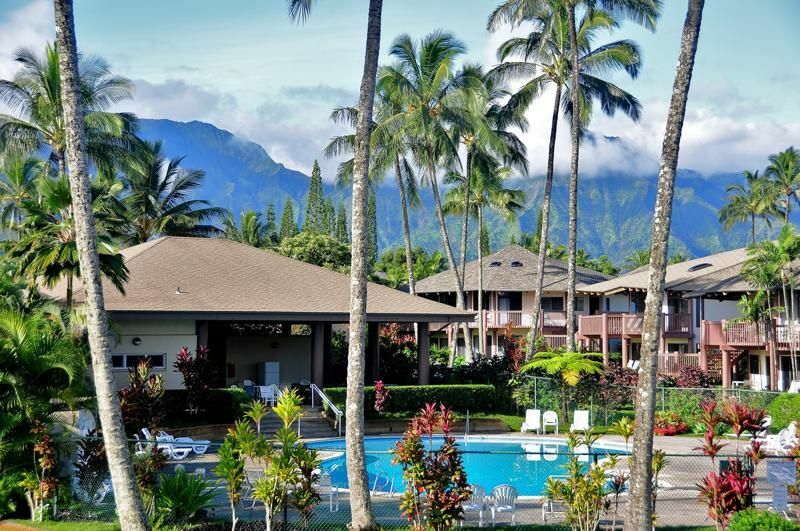 There is a grocery store within walking distance and Hanalei is only a few minutes drive away with lots of restaurants and beautiful beaches (try Chicken in a Barrel!). We used the pool every day even in the rain. Communication with Marsha was easy, as she remained available during our stay. I highly recommend this place for the convenient location but especially for the warm hospitality extended by the hosts! Thank you! Marsha's townhouse was great. Very comfortable, walking distance to Willie's beach (if you're up for a walk) and a short wade to Anini beach from there. The complex itself is peaceful and quiet, seems there are a lot of people actually live there and that makes it more "at home" and less of a hotel feel that I sometimes get from VRBO properties. That was actually a complete opposite: townhome was nicely decorated, had every imaginable cooking utensil and spice, plenty of beach towels, even snorkel gear and bodyboards! There is no AC, but ventilation is adequate with ceiling and floor fans (as most everywhere on Hawaii). We had a few rainy days, and there are board games and books to keep you busy in this case. Pool seem to be heated (nice for evening plunges), and quite large for such a small complex. Princeville plaza with Foodland/cafes/trinket shops/playground is within 10 minutes of walk. Highly recommend to visit Hideaways beach (another steep hike though), which is within a few minutes of driving, although with a tiny parking lot (go early). Few minor criticisms: downstairs bedrooms can get dump (but again, we had a lot of rain during our visit), and bathroom on the first floor might benefit from an update (everything was clean and functional though). Marsha was always available for questions when we couldn't find something right away, or when a kid got a jellyfish bite (hint: keep vinegar in your beach bag just in case). Overall - highly recommend the place, the owner does a terrific job keeping it up and making sure guests are comfortable. Beautiful location & all essentials for an awesome getaway. Our family had a great stay and couldn’t have asked for anything else. There were beach accessories available (chairs and coolers etc.) to use for our long days at the beach and that was a very nice addition. There are fans in each room that we didn’t expect to need to use but were definitely necessary. Thank you Marsha for your hospitality and being available to accommodate any of our requests. Our holiday was relaxing and enjoyable and your home was a key to its success. Aloha! My family very much enjoyed staying at the resort. The condo was super nice, in a perfect setting, furnished with everything needed to make your stay as comfortable as possible. The beds were the most comfortable. The fans in almost every room kept the condo comfortable. Having the beach gear accessible was probably the best feature of all, the coolers, snorkel gear, beach chairs and of course the boogie boards. The one and only issue we had was the neighbor. She made it hard to enjoy our stay, which was very unfortunate. Lucky for us, we were busy for most of the days. Overall, the condo owners were wonderful people and the resort was perfect, as well. Aloha Lori, It was our pleasure to host you and your family in our home. Thank you for your kind words regarding your stay and we are so pleased to here that you found our home the perfect place for your first trip to Kauai. Our apologies for the neighbor’s behavior. Thank you for bringing it to our attention. We hope all your other adventures and fun times you experienced will have you and your family want to return soon! Mahalo nui loa! - Cancellation policy: Full refund of initial deposit minus credit card processing fees if cancelled 60 days prior to check in. - If initial reservation deposit is paid within 60 days of check in, all sales final. - Until confirmed, rates are subject to change without notice. - The purchase of Travel Insurance is strongly advised during Hurricane season June 1 - November 30. - In the event of any 'Act of God' occurrence after the final payment is paid will not be refunded; all sales final.